Hey that's Willie! I just love Willie, always did, always will. Whoever is on the mound for the Kansas City Athletics is wearing that pukey green and gold although I have to confess that I always liked the sleeveless look, especially on the Reds and the Pirates. I'm looking at Willie's hands on the bat. Is there a small space between them? Hard to say. And I've always wondered about the optimal alignment of the knuckles on both hands on the bat - I wondered that as a kid, and I still don't know the answer. I assume trading Horton away was just part of breaking up the 1968 team that had aged on. He was traded for a nominal major league relief pitcher about 8 years younger. I know my old man flipped out about it to the point of purchasing a few pieces of Rangers swag that he tucked away into the garage but was eventually discovered by his two confused sons. I have to imagine that trade was very ill received. At the time of Horton's jersey retirement, I didn't really understand the full scope of his history to the team and the city. He had really good numbers, but they paled in comparison to Kaline (like a lot of other guys). But I've since learned more about him and his impact to the city. Was there an uproar from fans at the time of his trade? Just makes me want to cry still. Come on Tigers, be kind to your fans and just call the game already. Is it supposed to be an all day washout up there? I thought weather wasn't an issue after April 10? hey, I'm not complaining. It's not often the rain comes sideways hard enough to wash the living room picture window for me like it is now. Its a nice 75 and partly cloudy here at the beach today. I don't think that there was much of an uproar. I was certainly saddened by it, but he was 34 and almost out of gas, and the purpose of the trade was to make room for Steve Kemp. 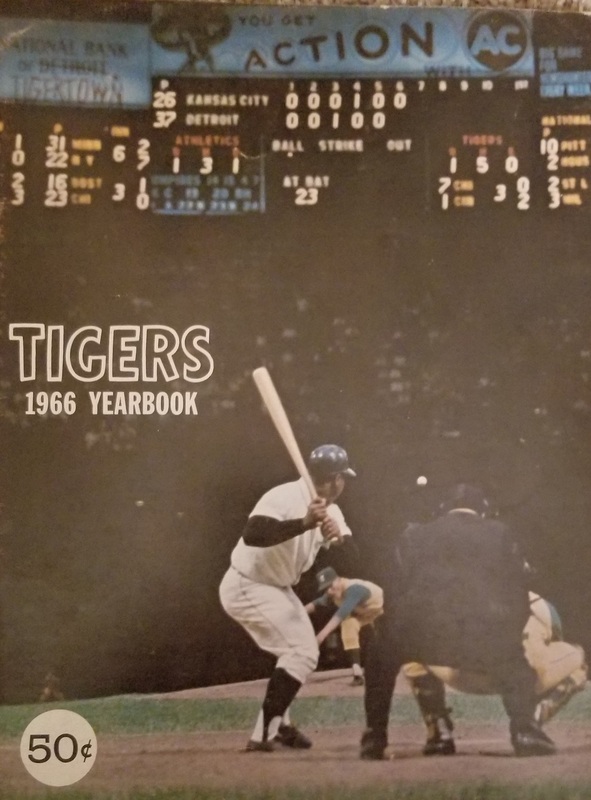 The Tigers did something nice for Willie - he started in left field on Opening Day, where he hadn't played for over 2 years, and then they completed the trade after the game. If I watch or listen to agame today it would be Cards at Reds, but it could be called as well. Is it cold today? Just really rainy. We're lucky it isn't cold, actually, we'd get 10-14 inches of snow today and tomorrow if it was. From what I have been reading, they'll be lucky to get both in tomorrow. We may end up with a straight up doubleheader starting around 5pm. Ok....the good news is, the Tigers will not lose today. The bad news is, they may lose twice tomorrow. I was certainly in an uproar over it. He was and still is my all time Tiger favorite. And for Steve fin Foucault. I also bought a Texas hat like your Dad. I am 60 so maybe same generation. It was sacraligious. I couldn't stand Steve Foucault. 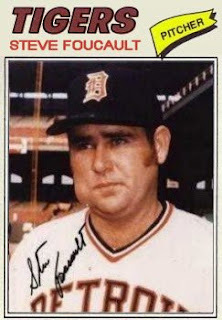 He was one of the most unathletic looking Tigers ever. He looked 50 when he was 27. Then they probably shouldn't have cancelled it so early. It's 4pm Detroit time, and no rain in sight. From the looks of the radar, there hasn't been any since 2pm ET. Maybe it was due to the temp. 36 with a stiff north wind is not fun. edit: looking at the weather, it's supposed to be much worse tomorrow, with rain all day. Why was this cancelled so early? Because the Tigers love their fans. My dad is 67, so around the same age. We found a Texas Rangers silver/metal stein, a felt Texas Rangers pennant, and a Texas Rangers team photograph. This was in the early to mid 80s that we found the stuff, and we were only a few years old at the time of the trade. It didn't make much sense to us at the time. Now that I think about it, I can see him getting impulsively upset about something like that, but I cannot see him impulsively buying that stuff since we didn't have much money. Its come a little full circle now. My daughter keeps asking to go to a Tiger-Astro game in Detroit. She also wants to vacation in Houston this summer. Sports. They can give you so much joy and also so much heartbreak. Got into low to mid 40s here. Lots of rain early on, coming off of the lake from the east. The Mud Hens got their game in this afternoon. Why was this cancelled so early? The boys wanted to go to Toledo to hang with Deuce Jr and Sr. Pops was in town to try his hand at the annual walleye run on the Maumee. But he didn't bring any gear. He wanted to noodle for the fish. Hey if your Daughter wants to go to ballgame on the Moon with her Dad I am sure you would be happy to oblige as I was ! baseball is definitely worth the heartache as it binds families and memories together.